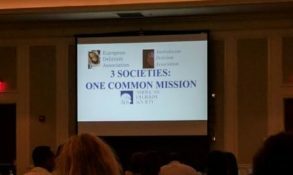 The American Delirium Society held their 6th annual meeting from June 4-6, 2017, in Nashville, Tennessee. 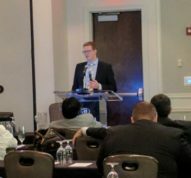 Along with excellent talks and poster presentations by many members of the delirium research community, NIDUS was honored to host 2 sessions: 1) a plenary session by NIDUS investigators introducing the program and our initiatives and 2) a scientific breakout session with presentations by previous participants of the Delirium Boot Camp. The “Introduction to NIDUS” plenary session featured an introduction by NIDUS PI Sharon Inouye, followed by short talks from each NIDUS Core and Task Force Leader on their upcoming program activities. 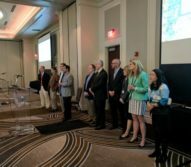 These included the launch of a survey on delirium measurement tools by the Measurement & Harmonization Core, an announcement about the Research Resource Core Database, and a call for applications for the 2017 Delirium Boot Camp and 2017 Delirium Pilot awards, as well as an announcement from the Dissemination Task Force about the NIDUS Blog, social media and other communication efforts. The NIDUS Scientific Breakout Session was very well attended and featured six presentations on a variety of topics: treatment of asymptomatic UTI in delirious in-patients, impact of dexmedetomidine of delirium incidence and sleep in critically ill adults, variation in antipsychotic use in adults after cardiac surgery, the association of age-related cortical atrophy and postoperative delirium severity, the relationship of the COMT Val58Met Polymorphism on the association between inflammation and delirium, and the association between STOP-BANG scores and postoperative delirium. 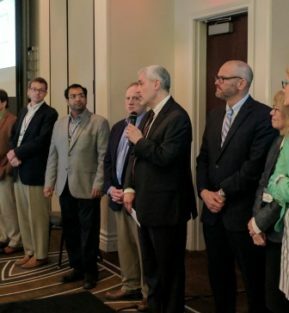 Rakesh Arora introduce the I-Delirium initiative – a collaborative partnership between 3 international delirium societies, the American Delirium Society, European Delirium Association and the Australasian Delirium Society. 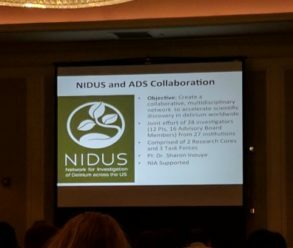 Outgoing ADS President Pratik Pandharipande introduced the collaboration between the American Delirium Society and NIDUS, as well as collaborations with other organizations such as I-Delirium. 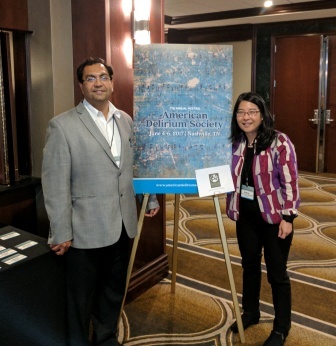 ADS President Pratik Pandharipande & NIDUS PI Sharon Inouye at the 2017 American Delirium Society Meeting. 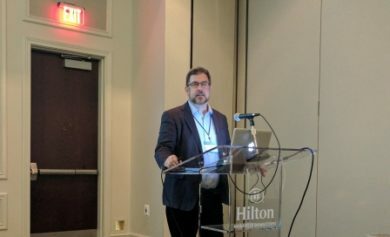 Wes Ely presents the cases for and against delirium screening before advocating for delirium screening at the 2017 American Delirium Society Meeting. Alasdair MacLullich advocates for delirium screening during a debate at the 2017 American Delirium Society Meeting. NIDUS Investigators answering questions following the Introduction to NIDUS Plenary Session, Tuesday June 6. Ed Marcantonio answers a question after the Introduction to NIDUS Plenary Session on Tuesday June 6. 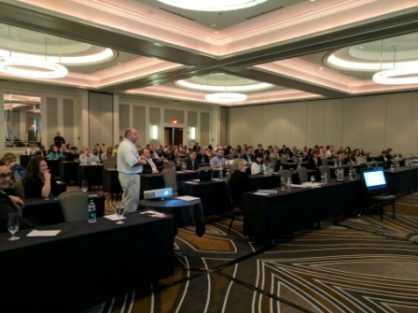 Audience at the Introduction to NIDUS Plenary Session, Tuesday June 6, Nashville TN. 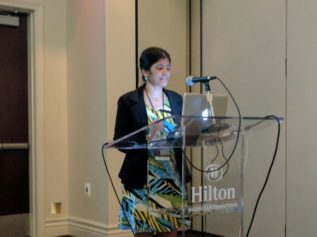 Monidipa Dasgupta presents her talk “Treatment of Asymptomatic UTI in Older Delirious Medical In-Patients: A Prospective Cohort Study” at the NIDUS Breakout Session in Nashville, TN on Tuesday June 6, 2017. 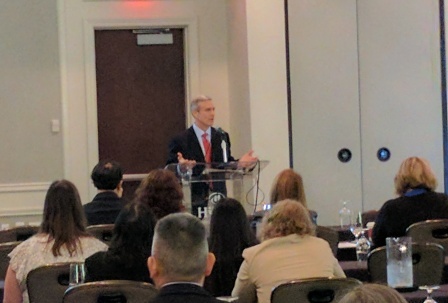 John Devlin presents his talk “Impact of Nocturnal Dexmedetomidine on Delirium Incidence and Sleep Quality in Critically Ill Adults” at the NIDUS Breakout Session in Nashville, TN on Tuesday June 6, 2017. 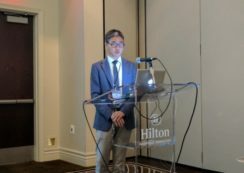 Dae Kim presents his talk “Variation in Antipsychotic Use in Hospitalized Older Adults After Cardiac Surgery” at the NIDUS Breakout Session in Nashville, TN on Tuesday June 6, 2017. 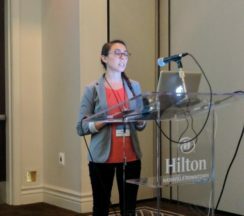 Annie Racine presents her talk “Baseline Age-Related Cortical Atrophy is Associated with Postoperative Delirium Severity” at the NIDUS Breakout Session in Nashville, TN on Tuesday June 6, 2017. 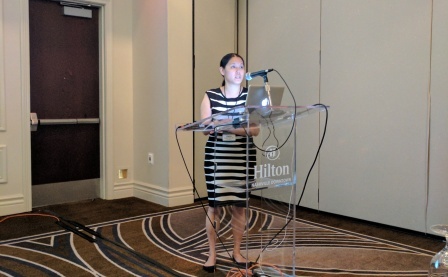 Sarinnapha (Fah) Vasunilashorn presents her talk “The Catechol-O-Methyltransferase Val158Met Polymorphism Moderates the Association Between Inflammation and Postoperative Delirium” at the NIDUS Breakout Session, Tuesday June 6 in Nashville, TN. 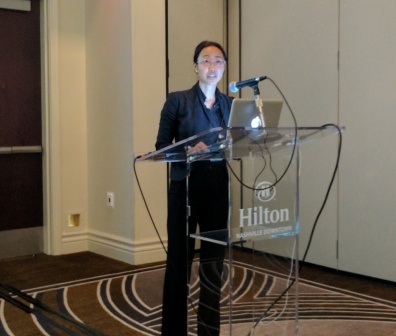 Sophia Wang presents her talk “Association between Preoperative STOP-BANG Scores and Post-Operative Delirium in Thoracic Surgery Patients” at the NIDUS Breakout Session, Tuesday June 6 in Nashville, TN. Posted in News and tagged ADS 2017, Delirium, NIDUS.